"An open source media player and entertainment hub for watching and listen to various types of media content." 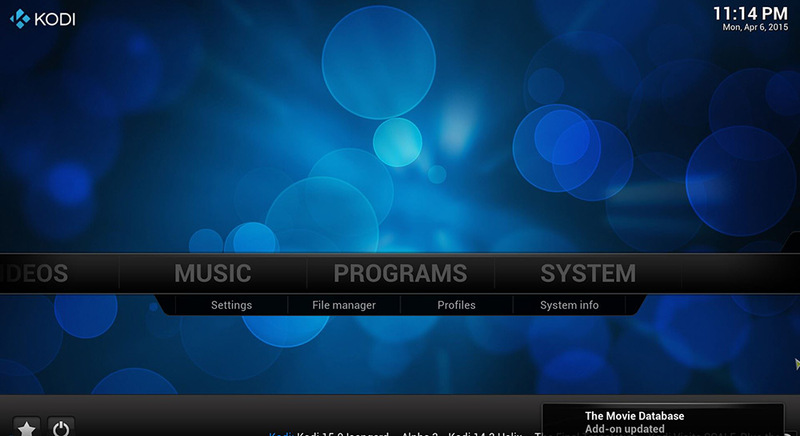 Formerly known as XBMC, Kodi is an award winning media player for watching and listening to your favorite content. This player requires you to point it in the right direction so it can provide you with the content - such as media websites and media locations on your computer. Being open source media player, that means there is a community backing Kodi and helping with its development. This means lots of features, frequent updates, and maximum stability. The great thing about Kodi is that it is available on mobile devices, Mac, and Linux systems so you can use Kodi on any type of set-up that you want. Kodi will only show the content you tell it to, which means you won't get a bunch of stuff that you do not want to see in the player - only your content and the content you have provided from the Internet sources that you link up with the player. The software allows you to listen to your favorite music, watch TV shows and movies, display pictures, record and watch live TV content, and has a ton of add ons to enhance the program to your liking. The user interface is the first thing you will notice, because it takes up your entire screen. It is clean, easy to navigate, and has a modern style that will seem like candy for your eyes. If you choose to use Kodi on a media PC that is connected to a TV, you can even program a remote to the application to enhance your content experience and truly make Kodi an entertainment hub for the media PC in your home.